Since April 5, Japanese McDonald’s started “Taste of Japan” campaign. What they are featuring now is the new style buns called “mochi mochi buns”, which are added mochi powder to give a mild chewy texture to the buns. 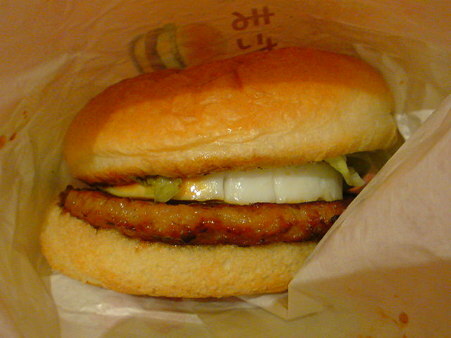 The “mochi mochi buns” are only available with “Teritama Burger”, which has teriyaki sauced hamburger and fried egg. By the end of this month, they will release another “Taste of Japan”, that is “New Filet-O Sesami Shrimp with goma goma buns”. It’s a new version of a regular Filet-O Shrimp burger. The buns contain white and black sesame paste. In May, they also release “Chicken Tasuta Burger”, Japanese style fried chicken burger that they used to have in the menu. “Teritama Burger with mochi mochi buns”, “New Filet-O Sesami Shrimp Burger with goma goma buns” and “Chicken Tasuta Burger”, which one do you want to try?